Leopard Tours will be participating in the IMEX tourism exhibition in Frankfurt, Germany, from 15th to 17th May, 2018 inclusive. We will be located in the Tanzania Stand No. C 450 Hall 8. Leopard Tours has a specialist department for Meetings, Incentives, Conference and Events (MICE), with an established infrastructure to cater for hundreds of guests at any one given time. With our network of offices and professional staff in key tourist centres in Tanzania including Dar es Salaam, Zanzibar and the Arusha Head Office, and a fleet of 300 motor vehicles, majority being 4WD (4X4) specially designed safari vehicles, we are confident of maintaining the highest standards of operating efficiency and customer care in the destination. 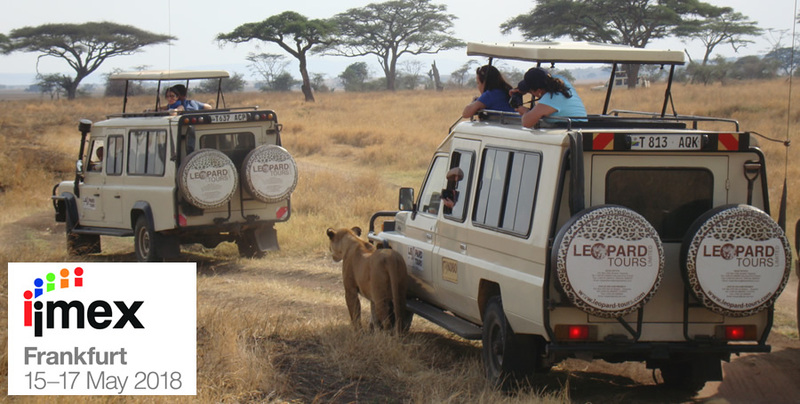 Leopard Tours is one of the most highly regarded Destination Management Companies in Tanzania with the requisite expertise and equipment, including a fleet of specially designed motor vehicles with comprehensive back-up facilities, for hosting a wide range of events. Our many years of experience, coupled with in-depth knowledge of the destination and attention to details invariably guarantee a seamless on-site management of events – starting from planning, choice of venue, site inspection, price negotiation with suppliers, actual operation of events, billing, and after sales services. Our key leverage include unrivalled buying power based on volume of business we produce to suppliers, and experienced professionals eager to innovate and create to ensure excellent results and success. The vision is to make Leopard Tours a natural choice in Tanzania for MICE planners.